Source: Los Angeles Times, December 17, 2001. Paul Keim's love of DNA research led him to study soybeans, trout, even snails. Now his work is at the center of the effort to find the anthrax terrorist. FLAGSTAFF, Ariz. -- New walls have sprung up around Paul Keim's workplace to safeguard the deadly vials kept within it. He has new keys, an electronic security card -- even bought his first pager so he'll always be reachable. The reason is anthrax. The lanky, bespectacled scientist is a world leader in the genetics of Bacillus anthracis, the bacterium that killed five, sickened at least a dozen and scared countless more in this fall's rash of terror by mail. Largely due to Keim, scientists can now use DNA profiles to distinguish one anthrax sample from another, a feat once deemed impossible because of the bug's extreme sameness. Whether gleaned from dead yaks in Nepal or bison carcasses in Canada, anthrax DNA varies in only the subtlest of ways. Keim's group has already used these methods to identify the anthrax strains that the Japanese cult Aum Shinrikyo used in 1993 in failed bioterrorism attempts. They've shown that an October anthrax outbreak among cattle in Santa Clara County was probably caused by naturally occurring anthrax and not bioterrorism. Federal law enforcement officials say Keim has played an important role in analyzing the spores used in this fall's anthrax attacks, giving them one of their best tools to help narrow their investigation. (Keim refuses to confirm or deny any involvement in the case.) A scientist at quiet Northern Arizona University, Keim never anticipated all the attention. Not the new walls, the unending calls, and certainly not the experience of finding himself dubbed a "bioterrorism warrior" by the popular press. His is a tale of what happens when basic bench science and world events collide -- when a researcher, quietly toiling, enters the glare of celebrity after the knowledge he's patiently acquired suddenly becomes a matter of popular demand. The experience is even odder, Keim says, because anthrax is just one of many life forms he has studied and not one he would have predicted to bring him fame. Keim's best-known work was in the kinder, gentler genomes of plants: He is credited with helping drag soybean-breeding into the modern molecular era. Once he even testified in a murder trial in which DNA from a tree linked the suspect to the site where a body was found. And he has studied a menagerie of animals over the years: small snails, trout, prairie dogs and mountain lions. Today, his is a lab where one worker might spend his summer steeped in anthrax genetics while another passes her days collecting plague-infected fleas from prairie dog burrows and one scours the genome of soybean lines for disease-resistance traits. The common thread through it all: state-of-the-art DNA analysis that identifies supersubtle differences between different creatures' genomes, much as DNA forensics matches blood at a crime scene to a suspect's. Keim says he thrives on all this wild variety. "I like talking science with people -- I can sit down with anyone working on anything and within 10 minutes figure out a collaborative project," he says. "I also have a hard time saying no." Keim, 46, got into anthrax almost by accident. After finishing his PhD in 1981 at the University of Kansas, he went looking for a job -- and first interviewed for a temporary position at the University of Utah. Raised in Kansas, he took one look from the plane at the Wasatch Mountains and knew he wanted to live there. He spent years at Utah working for a renowned biologist, Gordon Lark, who had a taste for scientific variety that helped shape Keim's own. In Lark's lab, people worked on genetics of kangaroo rats and bacteria, soybeans and viruses -- sending out research tentacles in whatever direction seemed fruitful or interesting. "He was a really intense guy who was really creative and constantly thinking outside the box," Keim said of Lark. "I worked on everything you can imagine." It was great, he says; he was having a scientific blast and not thinking much about career advancement. But he spread himself so thin that he didn't publish much, a drawback when he later sought permanent university employment. Keim still keeps a big stack of rejection letters. Had he published more at that point, he might have ended up at some plant genetics hotbed instead of less-renowned Northern Arizona University. On the other hand, to Keim's delight, the school is just a stone's throw from the Grand Canyon and a fly-fishing mecca, Lees Ferry. Keim's work at Northern Arizona started small. There was no anthrax back then, just Keim, a technician and some money from a seed company to study soybeans. But Keim needed a summer job to supplement his teaching salary. He got one with help from a former colleague who was working at Los Alamos National Laboratory in New Mexico. Starting in 1991, Keim would jump in his car each summer and drive 450 miles east to Los Alamos to study innocuous bacteria that degrade organic pollutants. Meanwhile, his friend Paul Jackson was studying something more exciting, Keim knew -- something exciting, mysterious and (as it turned out) not innocuous at all. "He was very secretive about it. It was tantalizing," Keim recalls -- and that's how it remained until Keim got a security clearance in 1994. He then learned that Jackson was doing research on organisms that hostile governments might use for biological weapons. Keim and Jackson began working together, developing ways to distinguish strains of microbes from one another using DNA typing. They had their choice of germs to work with, but opted to start with anthrax -- in part because it was considered high priority by the government, in part because the germ's monotonous uniformity made it the toughest nut to crack. "We thought: Well, if we can do it with anthrax, we can do it with any of them," Keim said. The team got to work, scouring the DNA of anthrax for places where strains differed even slightly from one another. 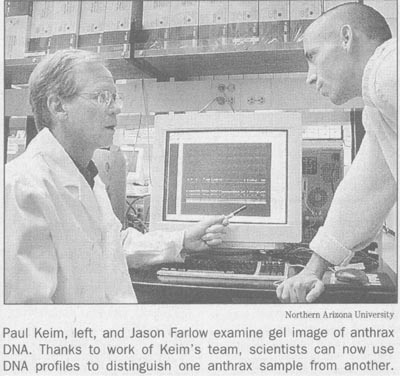 Keim would send samples of anthrax DNA back to his lab in Flagstaff. Technician Jim Schupp would run experiments on that DNA and send the results, in the form of X-ray films, back to Keim at Los Alamos. In 1995, there was only one known site of variability in the anthrax genome. Using that, all known strains of anthrax could be divided into only three types. By 1996, Keim, Jackson and their colleagues had found 31 sites that would occasionally differ among strains. But the real breakthrough came in 1999. The anthrax genome was being slowly decoded -- and, armed with that information, Keim and Schupp figured out how to home in on the most variable sites. Today, they've found more than 50 sites in the anthrax genome that vary, and vary often -- and over a thousand more candidate sites. They can distinguish hundreds of anthrax samples from one another. They can distinguish the British Vollum strain from the South African veterinary vaccine Sterne strain. They can distinguish one that caused outbreaks among Canadian wood bison this summer from the now-famous Ames strain, which appears to have first been isolated in 1979 from an Iowa cow. It was Ames, investigators say, that was used in the recent anthrax letter attacks. That ability opens doors not only to bioterrorism sleuthing but to all kinds of other anthrax knowledge -- where the microbe originated, how it later spread, and more. The trick is to track how the genome changed -- mutated -- as it moved from one place to another. "It's a major breakthrough -- a superb epidemiological tool," says Martin Hugh-Jones, veterinary epidemiologist at Louisiana State University in Baton Rouge and a longtime anthrax researcher who collaborates closely with Keim. " In the old days, all anthrax was just anthrax. We had all these theories about it. We couldn't test them. But now we can see because we can identify each strain. Paul turned everything on its head." Anthrax, despite its ability to infect people, is overwhelmingly an animal disease -- affecting everything from elephants in Africa to cattle in North America. Infection occurs when animals grazing on contaminated vegetation or feed inhale or swallow the microbe's hardy spores. Keim and Hugh-Jones have traced the path of those spores from the disease's evolution in Africa maybe 10,000 years ago, down the Nile and over to Europe and Asia with livestock and trade ships, then over to the Americas with the Spaniards and their Andalusian horses. Now the pair are studying anthrax's spread through the Western U.S. -- possibly via old cattle trails that Hugh-Jones has painstakingly researched using historical records. The fruits of his labor hang outside Keim's office: a large map zigzagged with colored lines marked "Santa Fe Trail," "California Trail" and more. Keim's group is DNA-typing anthrax found near the trails to see if they can use DNA changes to trace how the disease spread toward the west in the 19th century. Before the anthrax-tainted letters started appearing and people started getting sick, the germ Yersinia pestis, which causes bubonic plague, was the main push at Keim's lab. There was a large outbreak this summer among small mammals in Arizona, and Keim's group has been analyzing Yersinia DNA in hopes of unraveling the origin and spread of the disease. "I felt, personally, that this would be the project that gave us the most exciting scientific results. Anthrax was definitely playing second fiddle," he said. The spate of anthrax-laden letters rapidly changed all that. Inside Keim's lab on a recent visit, machines hummed and workers milled about. A row of black machines was busy with the first step of the DNA-typing method Keim excels at: bits of DNA, be they from plant, mammal or microbe, being copied over and over to provide enough material to work with. Elsewhere, a student opened up a large, refrigerator-like machine that's involved in another key step: figuring out the sizes of those tiny bits of DNA. Words like "anthrax" and "smallpox" drifted out of a room where a gaggle of students took a break: Two more students, sitting back to back, scanned similar-looking screens filled with rows and columns of numbers. Talima Pearson was busy analyzing DNA data from endangered birds called western willow flycatchers. 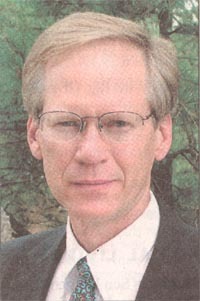 Scott Spurgiesz was similarly analyzing strains of tuberculosis. "Wasting time working on birds when you could be working on TB!" jibed Spurgiesz. "I'm just waiting for the time when Osama bin Laden decides to weaponize willow flycatchers," replied Pearson. The lighthearted mood persisted even under increased work pressure and greatly ramped-up security. The lab's 1,200 live anthrax samples have always been under lock and key, Keim stresses. But a few months back you could walk into the university's glossy new microbiology building, wander upstairs, then stroll down a corridor to Keim's research suite -- only then encountering your first locked door. For a week, an armed guard stood guard outside Keim's office. And soon the new wall and door went up. "You're inside of two or three levels of security already," Keim says as he escorts a visitor, bounding up the stairs and swiping his electronic key against the locked door. Several more levels remain before anyone can reach the "select agents" room, where anthrax and other noxious bacteria are kept and studied. No one but a select few people can get in there. "Security's changed," Keim says. "But everything's changed in the last few months, right?"